The ancient Egypt was one of the most advanced civilization for almost 3000 years. It started out as small settlements on the banks of river Nile, settlements grew into respective kingdoms. These kingdoms were then united into the Kingdom of ancient Egypt around 3100 BC. From there, began the tale of a civilization whose architecture and artifacts remain flawless to this day, giving testimony to once thriving kingdom and its culture. The ancient Egyptians made significant advances in art, architecture and lifestyle that kept them progressive and prosperous for ages. And without a doubt, Egyptians were the best builders. They built the majestic pyramids that set as a remarkable landmark till now. But ancient Egypt is not known for its pyramids only, there are many other contemporary facets that make it stand out. 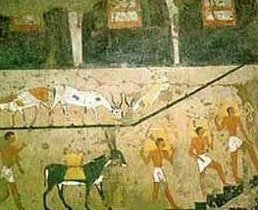 Here is a list of top 10 facts about ancient Egypt. In our modern time, the practice of applying makeup is usually done by women and rarely by men – unless required by respective cultures. 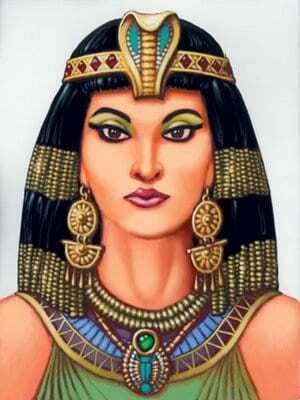 But in ancient Egypt, both men and women used to apply full on cosmetic makeup in their daily lives. In those times, the concept of beauty was not limited to one’s appearance and it was also a sign of holiness. Ancient Egyptians had a very spiritual perception for even the simplest aspects of life and cosmetics, being a popular routine practice, was no different case. They rubbed oil and unguents on their skin for protection from hot air. A red ochre paste mixed with water was applied to lips and cheeks using a brush, and they used to paint their fingernails yellow and orange. They gave special attention and detail to make up for their eyes. They would apply dye over both upper and lower eyelids, and would also add a line that extended from corner of both eyes to the sides of the face. It was their belief that wearing an elaborate makeup gave them protection of the Egyptian gods Horus and Ra. The Great Sphinx is one of the grandest monumental sculpture in the ancient world that bears the head of a human and the body of a lion. It is said to have been carved out of a large slab of limestone from the bedrock of the Giza plateau. 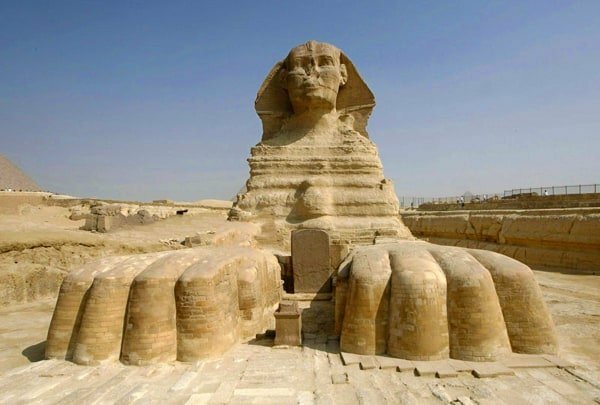 Ironically, being one of the largest single-stone statues in the world, the Sphinx’s full body was made visible only in 1905, when an excess of sand that covered it was cleared away. It has a rich history that carries with it along with the impressions of once blooming civilization. Even more fascinating is the mystery behind the ghastly corrosion on its face that the Sphinx has incurred despite the superior quality of stone on the head. The nose is entirely missing and legends say Napoleon’s soldiers hit the sphinx with a cannon and blew off the nose (though early sketches of sphinx show it without the nose well before the Napoleonic era). The ancient Egyptians enjoyed passing their time playing interesting board games. In fact, there were a number of board games like “Mehen” and “Mancala” but far more popular was the “Senet”. It was a hieroglyphic board game played in ancient Egypt as far back as 3100 BC. Even the widely known Egyptian Pharaoh Tutankhamen had a copy of the Senet board in his tomb, untouched for the past 3000 years until modern archaeologists found it. The game of Senet allowed two players at a time. It was played on decoratively carved boards like the one in King Tut’s tomb or simply on a board drawn on the ground. The board would consist of thirty squares drawn out in three rows of ten squares each. Not all the squares were carved with hieroglyphs. The carved hieroglyphs were symbols that represented good or bad omen, and changed the course of play likewise. A number of pyramids were built in the ancient Egyptian times, so it is conceivable to say that an extra-ordinary number of workers were deployed for their construction. But the belief that all these majestic pyramids were built by slaves or prisoners is a baseless misconception – they were built by regularly paid workers. In fact, historians stated that given the sheer scale of labor and engineering skills required to built structures of such massive size, at least two types of construction teams might have been deployed – both accompanied by skilled, permanent work force with royal stature. Laborers were paid in terms of regular rations. Most of the workers were respected for their skills, regardless of their background. Workers who lost their lives during the construction of the pyramids used to be honored and buried in the tombs near to the great pyramids they were building for their pharaohs. Ancient Egypt saw the rise and fall of quite a many popular Pharaohs including the likes of Khufu, Sneferu, Amenhotep, Ramses III, and Akhenaten. But the only known surviving and intact royal tomb is of rather famous (or infamous) Egyptian king Tutankhamun. It is such an irony that a boy king would become the greatest royal treasure from ancient Egypt – a pharaoh whose rule was nowhere near the accomplishments of the great Egyptian kings. King Tut’s tomb gave a golden opportunity to modern historians to study a pristine mummy of an Egyptian king that remained well preserved for more than three millennia. And then came the legend of the curse that would befall upon the ones who would dare to open the tomb of King Tut. The discovery of the tomb in 1922 was followed by a series of incidents that included a tragic end to a number of people involved in unearthing the tomb. Nevertheless, it was Tutankhamun’s tomb that helped modern society unravel the details of the contemporary New Kingdom of ancient Egypt. Along with the likes of Tutankhamun, Khufu, Ramses III and other popular identities linked with ancient Egypt such as the Pyramids and the Sphinx. 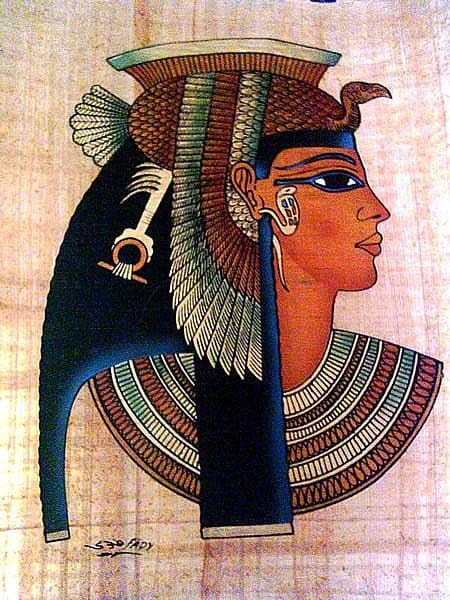 It is the name Cleopatra that earns a famous and well documented association to the ancient Egyptian civilization. But, even though she was born in Alexandria and eventually went on to become the last of Egyptian Pharaohs, she was actually a descendant from a long line of Greek Macedonians. In fact, she had direct association with the Ptolemaic Dynasty that ruled Egypt from 323 BC – 30 BC – a ruling fraternity whose cultural roots had a noticeable Greek connection. A clever tactician, she had her half-sister killed to eliminate any possible threat to her ascension. She also had an affair with Julius Caesar – a relation that proved to be very fruitful as he significantly helped her in becoming a pharaoh. Even her burial is the stuff of legends – it is said she was buried by her husband Mark Antony somewhere in Egypt, but no one knows the exact location to this day. Read more about Cleopatra VII. 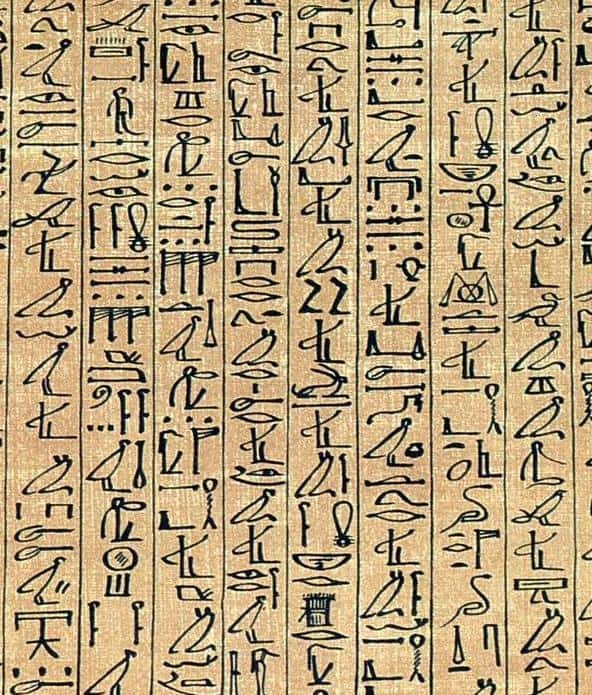 The Egyptian hieroglyphs were the formal writing method used by ancient Egyptians – a writing system that was basically a combination of icons and native alphabet elements. We are used to the 26 alphabets based writing system – the ancient Egyptian writers and inscribers used more than 2000 hieroglyphic characters. One of the oldest writing systems to have existed in the history of human civilization, the hieroglyphs were used to represent common objects from daily life. The origin point of Egyptian hieroglyphs is pretty obscure, even more so since it lacks any historically accurate precursor writing system that could later have evolved into its native structure. Most often, they also represented the sounds and many other perceptions of daily life objects. Even though the hieroglyphic structure seems rather complex (they are further divided into three categories), accessing its readability is relatively straightforward. People in ancient Egypt followed so many gods and goddesses – in fact, more than 2000 of them were dutifully worshiped. Each of these gods and goddesses had control over a certain facet of daily life – some deities were the reason for creation, some brought the annual Nile flood, some offered protection from all evil and ill – they truly had gods for everything. The demons were considered superior to humans, but not as powerful as the gods and goddesses. The primary gods represented the essential aspects of life. Amun Ra was considered the King of all gods and goddesses. 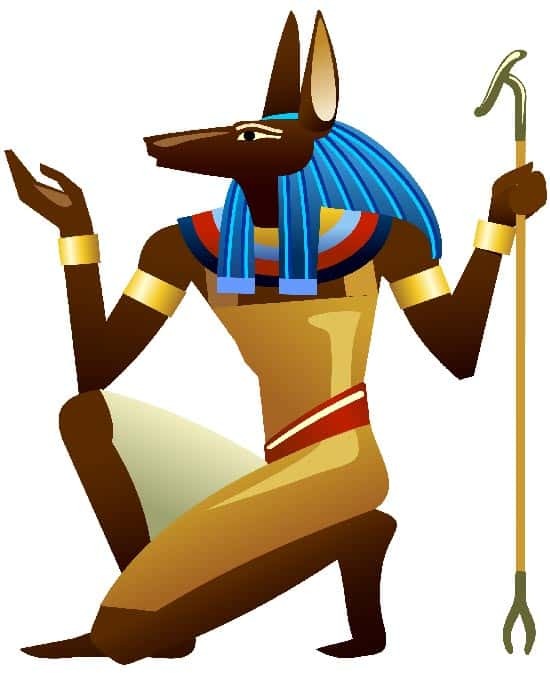 Similarly, Anubis was the god of death, and it was he who took care of embalming i.e. 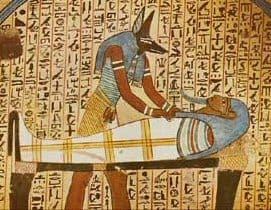 mummification of the dead. 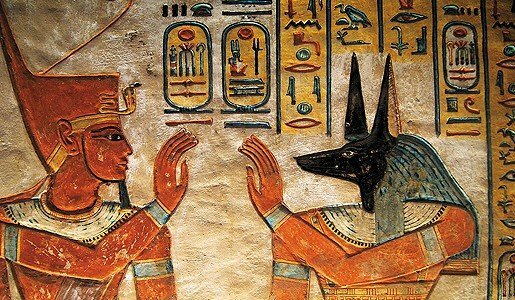 Probably the most significant deity was Ra – the god of sun and radiance. Ancient Egyptian religion puts immense thought on the journey beyond one’s death. Death was not the end of life as it is, but a mere point in time where the dead waited for eventual revival. They truly believed that eternal life can be attained even after death, given they are fortunate enough to gain the pity of their deities. They would mummify the bodies of their dead relatives and loved ones to make sure they get to use their bodies again once they get revived in their afterlives. The biggest believers of the afterlife were the Pharaohs, who went on to build the most majestic of tombs for their burial – the great pyramids. When they died, their bodies were mummified using the most elaborate of contemporary embalming methods, and then they were buried along with larger quantities of luxury items that they could use in their afterlife. Few millennia back, there was a time when ancient Egypt used to be one of the richest and most powerful civilizations in the world. During this period of time, the Pharaohs had a number of majestic pyramids built – of which the pyramids of Giza in particular are some of the most spectacular man-made structures ever made in human history. The first of these monumental burial sites for the third dynasty’s King Djoser was built around 27 century BC in the Saqqara Necropolis. The great pyramid of Giza was a construction of such sheer proportions that it held the title of being the tallest man-made structure for an unprecedented period of 3871 years. 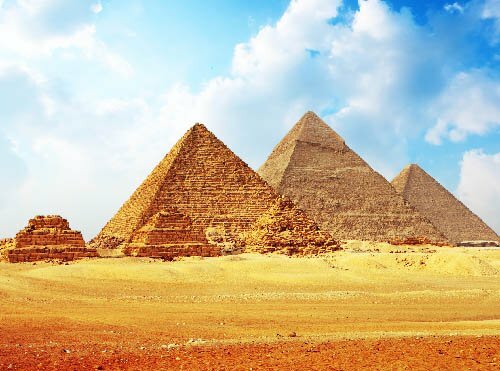 There are three major pyramids in Giza, of which the largest pyramid was built for Khufu – a pharaoh whose reign is primarily known for the magnificence of these pyramids. The rich history of ancient Egypt spawns far beyond the grandeur of its pyramids. In fact, the Egyptian history is so diverse and encapsulates so many facets of life in the contemporary civilization that scholars had to create a separate field of study for proper research and documentation. Enlisted above are the specifics on a civilization that was once at its pinnacle – details that fascinate historians and commoners alike today. Yes the history of Ancient Egypt is absolutely awesome, it is our freedom and shall give us the understanding of ourselves, when the world is ready to accept that cleopatra actually is in existence. and her knowledge is the original to complete our identity. Hence they cant find either Nefertiti or Cleopatra’s body. because her body is eternal. Archaeologists are still digging history to reveal many more facts and hidden mysteries under the soil of Egypt and I guess this will continue for ages to come and will never end. will change the country and we will build more facinating civilization.